Leaves, leaves, leaves - with so many left on the ground in autumn we show you 6 top tips on what to do with them, whether practical or arty. 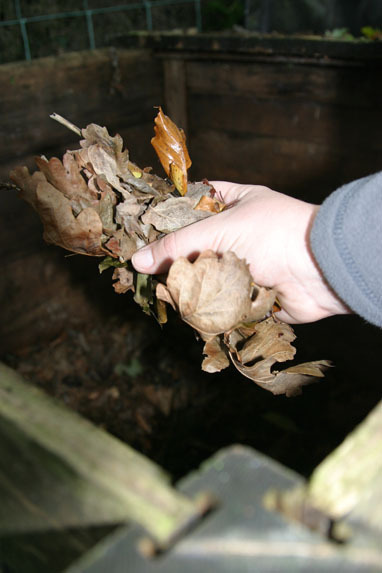 Autumn leaves are great for composting especially tree leaves. Tree leaves are rich in trace minerals as they have drawn in nutrients from the subsoil gained from the deep roots. Leaf mould is made up of solely fallen leaves. 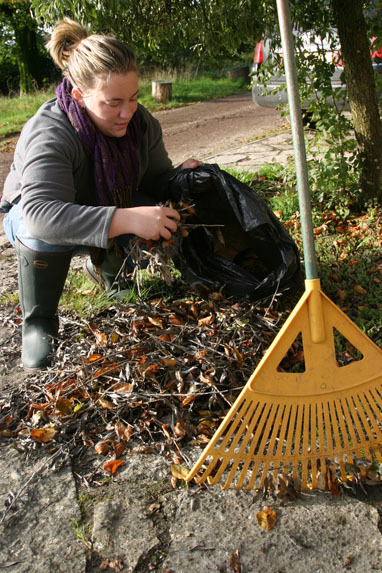 Place collected leaves into a bin bag with holes in it and wet them. 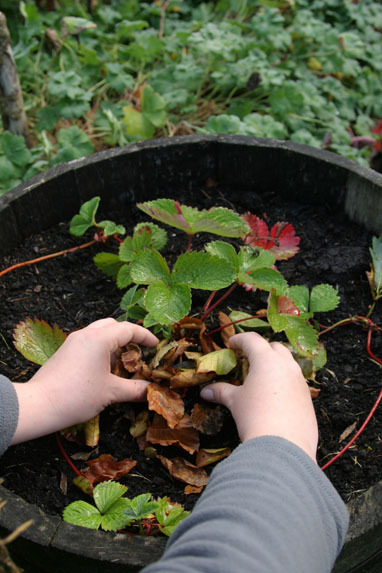 Once the leaves have rotted down in a year or so they can be used as a soil improver and as a mulch on borders. 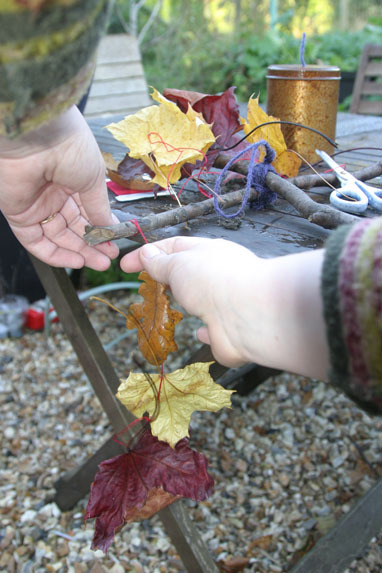 Felling arty – why not create a leaf mobile to decorate your garden. You’ll need: Two sticks, leaves, string, cotton, needle and scissors. Step 1 – Tie the two sticks in a cross with the string, adding a loop of string to the top for hanging. Step 2 – Select the 12 best leaves – trying to get a variety of size and colour. Step 3- Now thread the cotton through the leaves so you have four strings of three leaves. Step 4 – Tie the ends of the cotton to the sticks and ‘hey presto’ you have a mobile. One way to clear the leaves and provide life to the garden is by moving. 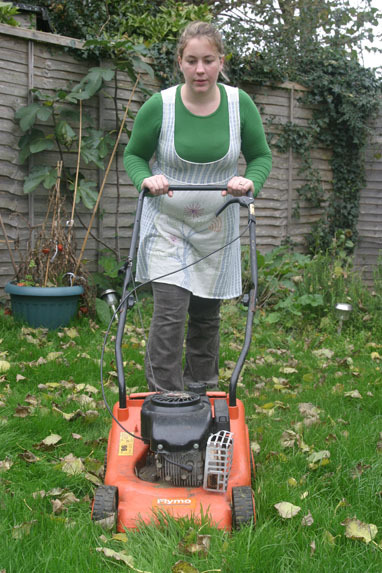 Mow the lawn on the highest setting so that the leaves get chopped up too. Leave the leaves on the lawn as a ‘mulch’. The worms will eat them, thereby improving the soil. Leaves can be collected and placed around the crowns of herbaceous perennials or tender shrubs that need protecting over winter. Tropical plants such as cannas, bananas and tree ferns will need wrapping up. Straw is normally used for this but dry leaves work well just as well. Why not get creative with the kids, this is great way to keep them entertained. Make sure you collect a selection of different leaf sizes and shapes. When you get home, take your leaves and place under some paper. 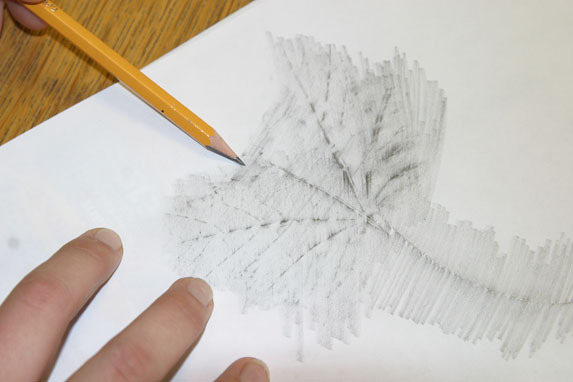 Then gently scribble over the leaf with a coloured pencil or plain pencil to reveal a lovely print.